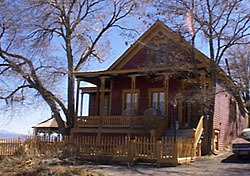 The C. J. Prescott house is a vernacular or "Folk Victorian" residence, and was built in 1864, the first year of Nevada's statehood. The original owner and builder, prominent businessman C. J. Prescott, was the proprietor of one of the first lumber companies on the Comstock. Prescott's home, and several others built during Virginia City's initial settlement, were embellished with elements of several styles popular at the time--including Greek Revival, Gothic Revival and Italianate. The Great Fire of 1875 destroyed much of the town's building stock and when it was rebuilt the following year, Italianate became the predominant architectural style. The earlier Greek and Gothic Revival examples like the Prescott house are therefore rare survivors in Virginia City. The home's Greek Revival style details include side lights and transom around the front door and the raking molding on the gables of the roof, whereas the form of the room and entrance to the house from the gable end are typical Gothic Revival style elements. Italianate influence is evident in the tall first story windows and chamfered porch posts. The picket fence surrounding the yard is original, as are many interior features including the marble fireplace surround, plank flooring and tongue-and-groove paneling in the kitchen. Some of the original furnishings remain as well, such as the kitchen cabinets, flour bin, coal-burning stove and the bathtub on the first floor. The Prescott House is located at 12 Page St. (previously Hickey St.) in Virginia City. The home is privately owned and not open to the public.